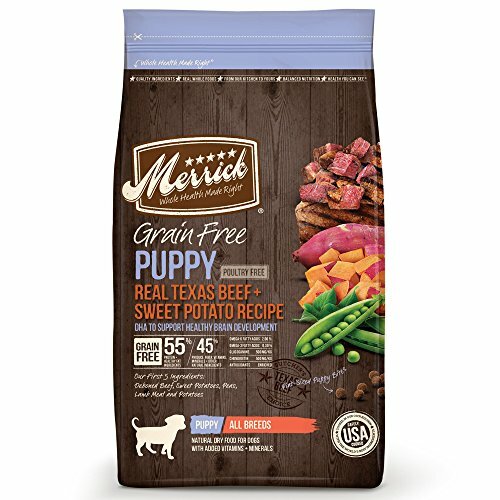 Is Merrick the right puppy food for my puppy? Hi there once again, puppy-lovers! Have you been wondering whether Merrick make a puppy food that will support, nourish, and protect your little fluffy friend? We’ve been wondering the same, and are very much pleased to inform you that chances are, the answer is a resounding YES! After all, what’s not to love about organic, nutritious, balanced, complete, and tasty puppy food that includes grain-free, hypoallergenic, and size-specific options? Why the Merricks dog food reviews and Merricks puppy food reviews? When should I start my puppy on solid food? My puppy is so picky, he will only eat twice a day. What shall I do? Merrick have been around since 1988 when found Gareth Merrick decided to create a range of healthy and natural dog treats. Several years later they were making their first kibbles, and quite quickly after that, they began cornering the premium end of the market with their real meat, real veggie, and fruit formulas. While they were acquired by Nestlé-Purina in 2015, they’ve thus far continued to manufacture from their certified organic plants in Texas. So, yes, they’re American! Not all dog food brands have certified organic manufacturing facilities, heck, a lot of our other very favorite brands don’t even fulfill this criterion, but Merrick does! What this certification actually means is that Merrick’s Texas plants make products in a way that adheres to specific industry-approved methods. Very briefly, these methods are considered responsible in terms of the environment, resource use, and not genetically modified in any way. So, all-natural. Which is the best way. Backcountry, a dry dog and puppy food range that’s inspired by your puppy’s canine ancestors. Each bag of kibble contains both freeze-dried, uncooked fish, poultry, or meat. This means the protein percentages in these formulas can reach as high as 38%. Limited Ingredientkibbles and wet puppy foods for those little puppies who may need either a single protein source due to intolerances or who might need to stay away from the more common potential allergens like beef and chicken. Classic, USA-made, protein-rich, and only using those grains that are easy on puppy digestion. So, you’ll find ingredients such as brown rice, oatmeal, barley, and even quinoa in this range. Grain Free recipes that are available in wet, dry, puppy, adult, and some breed-size formulas too. These contain no grains whatsoever, as the name implies, and you’ll find an awesome wide choice that includes rabbit, lamb, duck, turkey, venison and many more! One thing that Merrick don’t make is breed-specific chow or kibble. So you won’t find anything that’s specifically formulated for your Labrador, Dalmatian, or Yorkie here. But we’re more than satisfied with the fact that all their size-specific foods are entirely AAFCO-approved. Are wholly transparent with their customers about the ingredients they use- no ambiguous ‘meals’ please! Have a great reputation, and are recommended by vets- and you guys! Let’s have a closer look at the Merrick puppy food reviews, and see the products we believe made the cut! 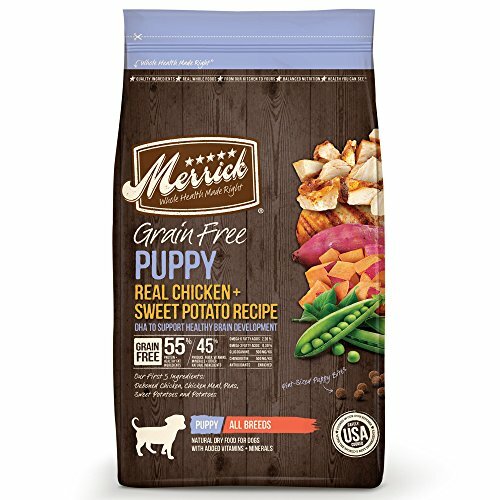 Merrick Grain Free Puppy Real Chicken & Sweet Potato Dry Dog Food, 25 Lbs. Chicken’s got the starring role in this dry kibble- free from all those yucky by-product filling ingredients but packed full of natural nutrients! 28% protein is super for those of us with growing puppies, and at 12% fat, this recipe’s perfect for energetic pups! If you’ve got a pup who’s allergic to potatoes, you may want to check out the hypoallergenic dog food option instead. Completely free of all wheat, with zero corn and absolutely no soy. So yeah, it’s gluten-free alright, and perfect for little puppies of all shapes and sizes! This is absolutely a recipe for those of you looking for multiple protein sources for your adult dog’s dinner. It’s suitable for all doggy sizes, from Chihuahuas to Great Danes! Starring ingredient is…buffalo! Isn’t that a nice change for your furry adult friend? Flaxseed oil, alongside salmon oil, and so many real veggies mean this recipe’s chock-a-block with vitamins. 16% fat may actually be a little high for purposes of maintenance, but if you’re making sure that you’re taking your dog out for plenty of exercise, this figure should be perfect. Merrick’s make a good grain-free kibble for sure- apart from all the great things we listed above, it’s free both from milled by-products and uses only entirely natural preserving agents. 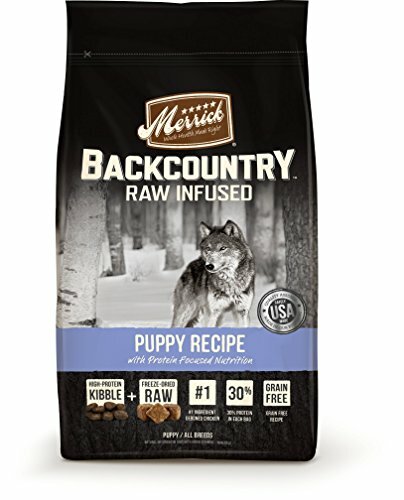 Merrick Backcountry Grain Free Raw Infused Puppy Dry Food, 12 Lbs. Here’s a Merrick puppy food review for an amazingly protein-rich, all-natural formula that’s based on some of the things your puppy’s ancestors would have eaten out in the wild. Perfect for Huskie puppies, don’t you think? Suitable for all puppy sizes! Nope, we’re super pleased with this recipe, the top fiveingredients are completely natural! Part of the reason this puppy food is so great for your little one’s growth is that there are real chunks of freeze-dried, uncooked fish, poultry and meat designed into the kibble. These are what help to make it so rich in natural, healthy, and lean protein! 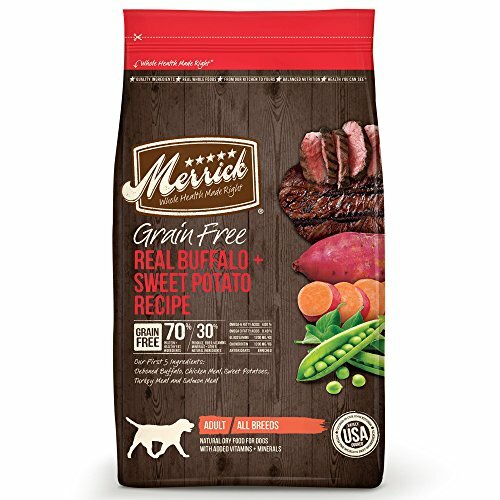 Merrick Grain Free Beef & Sweet Potato Dry Dog Food, 25 Lbs. Texas Beef for your puppy…how adorable! Another wholesome recipe that’s wholly, deliciously grain-free and, therefore, well-suited for those gluten-free pups. Same as with the grain-free, chicken-based Merrick puppy food review above, this one contains potatoes. We love that it’s without any by-products, that it’s gluten- and also completely grain-free, that it’s got loads of natural veggies, and that the nutritional profile is just perfect. Five out of five stars! 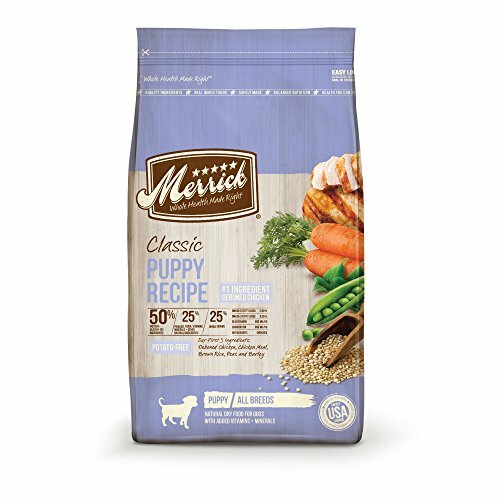 Merrick Classic Dry Puppy Food, 12 Lbs. Ahhh, a classic chicken dinner! This formula’s got brown rice for easy digestion and carbs, but it skips the potato entirely, so is suitable for those puppies who may have an intolerance to the latter. Once again, it’s fine for you to feed this to small petite puppies, large puppies like German Shepherds, giant puppies like Mastiffs, and everything in between! Besides peas, blueberries, and apples, this recipe’s also got carrot and alfalfa! No cons that we can find, but depending on your budget you might find it a little less economical than some of the lower quality brands. Health-wise, this recipe gets a clear five stars out of five. It contains so many of the best things that we look for in puppy foods- real veggies, real fruit, a natural DHA source, glucosamine, and healthy protein levels for all-around great development. 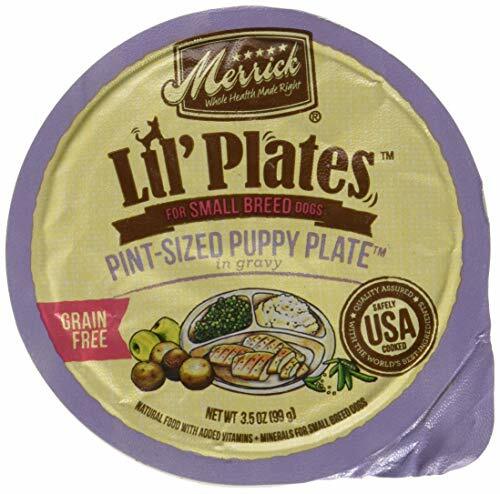 Lil’ Plates is for lil’ dog breeds! And because this chicken recipe’s a puppy food too- so it’s a pint-sized puppy plate…isn’t that just overwhelmingly cute? At 95 kCal per bowl, it’s great for smaller puppy dogs who will need to eat quite regularly to avoid hypoglycemia. We have no problem with it, and think it’s great as a first puppy food! As with all wet puppy foods in general, this one’s a healthy way to get your small puppy some moisture. It’s also well-suited for your puppy’s first introduction to solid food in general, as it’s easy on their digestive tracts. 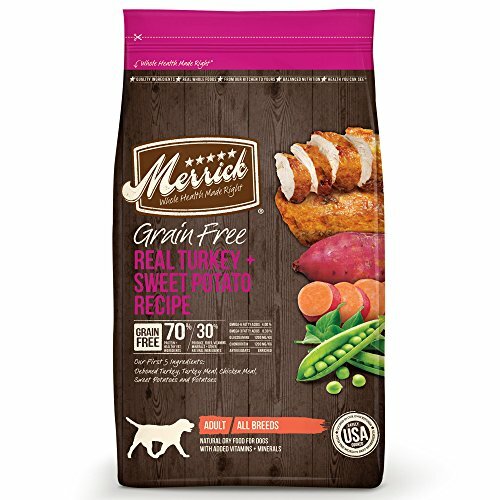 Merrick Grain Free Real Turkey & Sweet Potato Dry Dog Food, 25 Lbs. With turkey as the key protein source, this one’s an adult doggy dinner-time option for those pooches who can’t handle certain meats. Lots of tasty vegetables in this delicious, lean meat dinner- we’re looking at peas, sweet potatoes, alfalfa, and fruits like blueberries, too! Not suitable for dogs with chicken allergies. While it’s not from their Limited Ingredient range, it steers clear of beef, which is one of the most common allergens for canines. That having been said, Merrick make a very good Limited Ingredient range, which means it’s likely that whatever your dog’s allergy may be, there’s something for them there. According to the majority of vets, the later part of the 3-4 week mark is the best time to start slowly taking your puppy off their specially-developed weaning formula, and introducing them to solid food. Of course, this, too, should be a gradual process, so you’ll want to start your puppy off with a soft, wet food like the one we’ve recommended in our Merrick puppy food review. Mixed something like this in with a little water, and make sure to serve it to your little one on a flat and shallow surface. Something like a cookie sheet works perfectly! You may need to give him a soft little nudge on the top of his head, if necessary so that he is able to smell the soft blend of food, and you’ll find that he should start lapping up his new food. It’s also not a bad idea to get your puppy acquainted with kibble around this time, though this should also be softened considerably with water during these early stages. This is a funny one- if you’ve got more than one person in your household, make sure you all know who’s feeding what to your puppy. It may be that someone else is feeding your pooch a treat a day or a little snack without knowing that you’re doing the same, which means that he’s getting more food than you think!